This month we bring you the stories of three women who find themselves in places that seniors, or women, or senior women, rarely find themselves. Shattering barriers, glass ceilings and cultural norms this month are an octogenarian obstetrician, a nonagenarian monarch, and a centenarian fashion model. Caregivers and homecare companions know that seniors are living longer, happier, more active lives than ever before, and these three ladies are just three outstanding, history-making examples! Forty-three years ago, obstetrician Joana Ramos da Rocha began making house calls to remote villages in Brazil, because the nearly 300 patients there have no access to obstetric care without Joana. Now in her 80’s, Joana would like to share the responsibility with another doctor, but apparently the 72-hour boat ride and the seasickness are a deterrent. Yes, Joana travels every month to four islands off the coast of Brazil by houseboat to villages who call her their ‘Patron Saint’. The villages are filled with children she’s delivered herself, and they aren’t easy to serve. The hardships include just four hours of electricity a day, travel by canoe where the houseboat can’t go, and rough terrain between villages, but Joana has no intention of laying down her charge. She says her grandmother lived to age 116, and she herself feels great, at age 82. Joana could give up a tough job, and no one would blame her, but she has high expectations of herself, and she intends to meet them. You may have heard of her, but you probably don’t give her much thought. The rest of her family shines in the spotlight, with their riveting fashion choices, magical weddings, scandalous tabloid affairs (in the bad old days), and gorgeous new babies. Are you thinking Kardashian? Shame on you! This matriarch reigns in the background with her herd of corgis, love of horses, and matchy-matchy ensembles fit for a queen. Who is she? Why, the Queen, of course. Queen Elizabeth II of Great Britain celebrated her 90th birthday on April 21st, and the country will celebrate this milestone birthday with her over the next month with extravaganzas and exuberance. Queen Elizabeth took the throne in 1952, and has been the constitutional monarch of Great Britain for more than 60 years, reigning over a period of unprecedented change in British society, in Western culture, and in the world. And she reached her 90th birthday while Queen, thus accomplishing something no other British monarch has ever done, male or female – take that, law of the first-born son! Even her namesake, the Tudor Queen Elizabeth the First, died at age 69 after reigning for 44 years, a very long time during that tumultuous period. Queen Elizabeth II is a nonagenarian who has just shattered a glass ceiling available to very few others in the world! British Vogue will celebrate its centennial this month, with its May 5 issue featuring special features and ads from major advertisers. 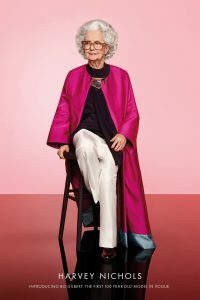 Harvey Nichols, one of Britain’s great fashion and style brands, created a special ad for this month’s issue, featuring a centenarian model. Bo Gilbert, age 100, is also the first centenarian model to ever appear in British Vogue, but you would never know by her poise and demeanor. In her first-ever photo shoot, Bo Gilbert, an ur-fashionista who stills wears heels and makeup every day at the assisted-living facility where she lives, drips with bespoke labels like Lanvin, Dries Van Noten and Victoria Beckham. She is also featured in a documentary film that exposes ageism in the fashion industry. This month, Bo breaks a barrier that is decades thick, in an industry that thinks 25 is over the hill! Go Bo!